The Model E variable area flow meter by Kytola features a flow adjustment valve and is available in single tube and multi-tube options. 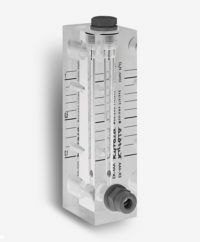 Constructed from high-quality acrylic with clear print for efficient reading, the Model E is typically used in air and water purging, and shield gas measurements. The unit’s maximum working temperature is 75°C and maximum pressure load is 20 bar (30 bar/30°C). This component has several options for customisation, including special scale marking, thread adapters and an inductive low or high flow alarm. If your application requires a special construction, please contact our team to see how we can help.